A lot of us crave to understand why the universe behaves in the way it does. And for a long time, as an ardent atheist/scientist, I've put my faith in physics to deliver the ultimate Answer -- especially those studying the Small World: quarks and whatnot. But I've concluded that I'm barking up the wrong tree. Pure scientists seek a different set of answers. Why does matter turn into sparks, and then into probability waves, and then nothingness at the lowest levels? Why do particles pop in and out of existence in a vacuum? How did all of these physics constants get set to exactly what they needed to be for suns to burn, galaxies to form, life to develop? If waves need to move through a medium, then how do electromagnetic waves move through a vacuum? Now, scientists talk about a Theory of Everything, but they mean something qualitatively different. They want an equation -- theirs is "What is the Universe? ", not "Why is the Universe?" 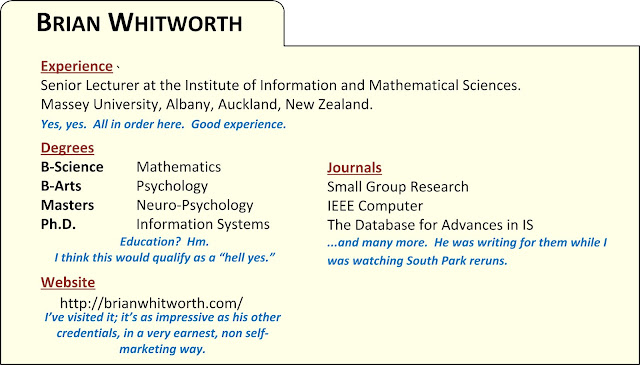 The cool thing is, I think I've found the Answer -- or, at least, a science-philosopher named Brian Whitworth has. But before I get there, let me spent a bit more time explaining why physicists are unlikely to provide an answer any time soon. It might sound strange to give up on science: Physicists are learning new things all the time. Hell, they just discovered the Higgs Boson! How can I write them off!? Aren't they literally at the very edge of our understanding? They certainly are learning new things all the time -- but ever since Heisenberg and the Copenhagen Interpretation, they've given up on answering why things are they way they are. They're focused on what is. And what is ....is weird. It's nothing like our world. Things spin in multiple dimensions simultaneously. Things are here and not here. Describing the Small World isn't like "they're all red jumpy particles that dance and sing!" No, it is described in some heady math and ill-fitting analogies -- because analogies imply similarity, and this stuff is similar to so little that we can conceive of. As an illustration, consider the Standard Model, which is the closest we currently have to a Theory of Everything. Don't get me wrong: This is awesome frickin' knowledge. Our ability to understand and work with the finest particles is actually growing by leaps and bounds, as evinced by every goddamn new gadget that comes to market (the next unbelievable-breakthrough, to me, are the new OLED televisions, apparently organic led's have phenomenal color). If my hero Ray Kurzweil is right, then within 100 years, our understanding and knowledge will be expanding outwards at the speed of light. I mean, big things are coming. But this progress is unlikely to give us any "why" Answers, at least for now. Is reality analog or digital? Most of the entries are, from a layman's perspective, total duds: Hyper-mathematical past the point of meaning. But occasionally there are these beautiful gems, written more by scientist-philosophers than pure scientists, that I feel point towards the truth. Brian Whitworth wrote one such gem. 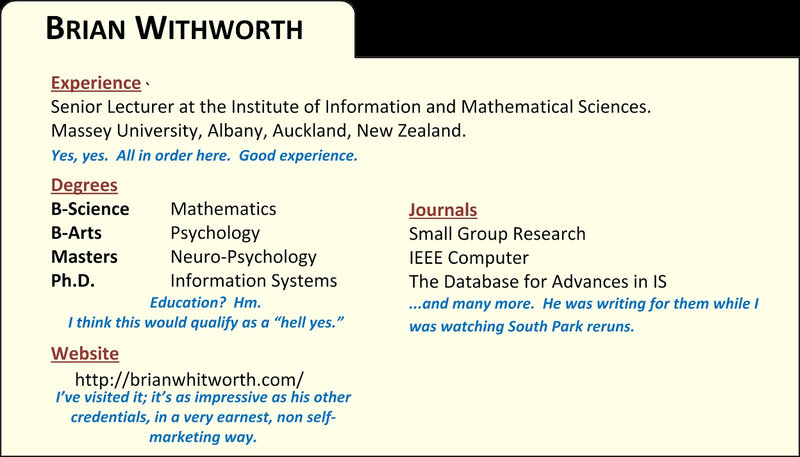 And before I get to his (admittedly, mind-bendingly radical) idea, allow me to provide some background about him. Pretend you were hiring someone to guess the Answer. Would you hire him? I certainly would. Instead of paraphrasing what he says, here is how he put it, on the Foundational Question Institute's website (www.fqxi.org), as his submission to their annual essay contest. Warning: This paragraph is idea-dense. Take it one sentence at a time. Pause to ensure you understand it. You can do this. Pay attention. We take our world to be an objective reality, but is it? The assumption that the physical world exists in and of itself has struggled to assimilate the findings of modern physics for some time now. For example, an objective space and time would just "be", but by relativity, our space can contract and our time can dilate. Likewise objective "things" should just inherently exist, but the entities of quantum theory are probability of existence smears, that spread, tunnel, superpose and entangle. Cosmology even tells us that our entire physical universe just "popped up", from nowhere, about 14 billion years ago. This is not how an objectively real world should behave! Yet the usual alternatives don't work much better. That the world is just an illusion of the mind doesn't explain its consistent realism and Descartes dualism, that another reality beyond the physical exists, just doubles the existential problem. It is time to consider an option we might normally dismiss out of hand. This essay explores the virtual reality conjecture, that the physical world arises from non-physical quantum processing. It finds it neither illogical, nor unscientific, nor incompatible with current physics. Its implications include that the world is digital at its core. In other words, our universe is a vast, hyper-rich holodeck-like enviroment, running on some cosmic computer. It's a computer simulation. As someone who has been reading, searching for a general idea that ties it all together, this paper finally did it for me. 95% of people will immediately jump to the idea of the Matrix. That is not what he's saying. Indeed, that damn movie probably set this idea back a good decade, by kind of "claiming" the whole "we're in a simulation" idea, but then distorting it to ridiculousness. In that movie, the universe was an entire simulation except us. We humans existed, more less identically, in both. I mean, it's a great movie, but it's an epistemological ego-trip of the highest order. No. Brian is saying that the entire UNIVERSE is a simulation. And this angle answers a lot of questions. In his article, he elegantly addresses all of the questions I wrote at the very top. While I'm only a scientific layman, I actually know a fair bit about building and working with simulations. I've built simulations at work, and have a good sense of coding. Here is why I believe in what Brian says -- all of the "why" questions I laid out earlier are not only possible in a simulation, they're unavoidable consequences of being in a simulation. For example, a simulation would REQUIRE a speed of light. It would REQUIRE that at some point, matter turns into sparks and then probability waves. It would REQUIRE fine-tuning constants ahead of time. You literally could not build a simulation without dealing with each one of these issues. I'm not sure. It certainly doesn't tell us why the simulation was built. I suppose knowing that would be to know the mind of God. Anyway, it's a start. It's the best Answer I have for now -- and for that, I thank Brian.